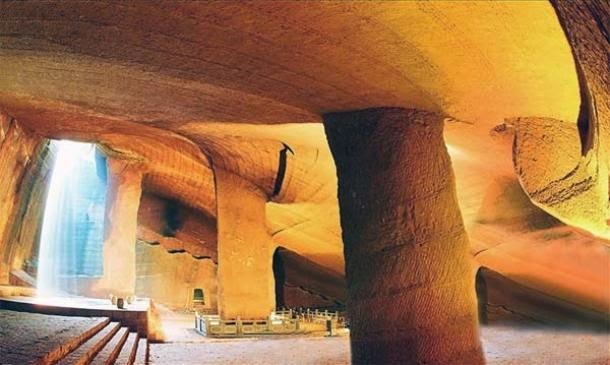 Located near the village of Shiyan Beicun in Zhejiang province, China, lies the Longyou caves - an extensive, magnificent and rare ancient underground world considered in China as ‘the ninth wonder of the ancient world’. The Longyou grottoes, which are thought to date back at least 2,000 years, represent one of the largest underground excavations of ancient times and are an enduring mystery that have perplexed experts from every discipline that has examined them. Scientists from around the world in the fields of archaeology, architecture, engineering, and geology have absolutely no idea how they were built, by whom, and why. First discovered in 1992 by a local villager, 36 grottoes have now been discovered covering a massive 30,000 square metres. Carved into solid siltstone, each grotto descends around 30 metres underground and contains stone rooms, bridges, gutters and pools. There are pillars evenly distributed throughout the caves which are supporting the ceiling, and the walls, ceiling and stone columns are uniformly decorated with chisel marks in a series of parallel lines. Only one of the caves has been opened for tourism, chosen because of the stone carvings found inside which depict a horse, fish and bird. 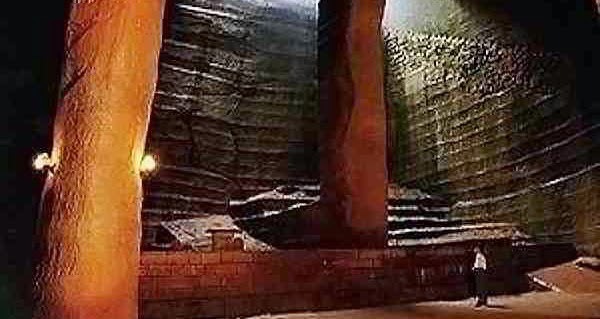 The Longyou caves truly are an enigma and here we will explore ten mysteries that are still unexplained despite more than two decades of research. 1. How were they constructed? A rough estimation of the workload involved in building these five caves is awe-inspiring. The quantity of rock that would have been removed in the overall excavation of the grottoes is estimated to be nearly 1,000,000 cubic meters. Taking into account the average digging rate per day per person, scientists have calculated that it would take 1,000 people working day and night for six years to complete. These calculations are based purely on hard labour, but what they haven’t taken into account is the incredible care and precision of the sculptors, meaning that the actual workload would far surpass the theoretical estimation. As for how they were constructed and what tools were used, it is still unknown. No tools have been found in the area, and, as we will explore later, scientists still don’t know how they achieved such symmetry, precision, and similarity between the different caves. Despite their size and the effort involved in creating them, so far no trace of their construction or even their existence has been located in the historic record. Although the overall excavation involved almost a million cubic metres of stone, there is no archaeological evidence revealing where that quantity of stone went, and no evidence of the work. Moreover, there is not a single historic document that refers to them, which is highly unusual considering the sheer scale of the project. Their origin is a complete and utter mystery. 3. 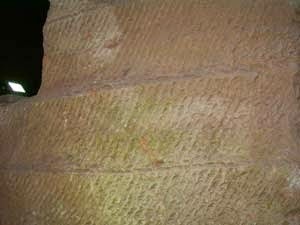 Why were the walls chiselled? Every single one of the caves is covered, from floor to ceiling, in parallel lines that have been chiselled into virtually every surface. The effect is a uniform pattern throughout the caves, which would have required immense manpower and endless hours to create. The question is why? Was such labour-intensive work purely for decoration? Are the lines or patterns symbolic in some way? All that is currently known is that the markings are similar to those found on pottery housed in a nearby museum, which is dated between 500 and 800 BC. When the caves were first discovered, they were filled with water, which presumably had been there for a long period of time. They had to be pumped out in order to realise that these were not just like the other ‘bottomless ponds’ found within the area, but man-made structures. Most villages in southern China contain very deep ponds, which have been called "bottomless ponds" by generations of villagers. These ponds teem with fish, which are easily caught. However, after the first cave was pumped dry, not a single fish was to be seen, or any other sign of life. 5. How did the caves remain so well preserved? One of the most interesting and challenging questions is how the caves have been able to keep their structural integrity for more than 2000 years. There are no signs of collapse, no piles of rubble, and no damage despite the fact that in some areas the walls are only 50 centimetres thick. 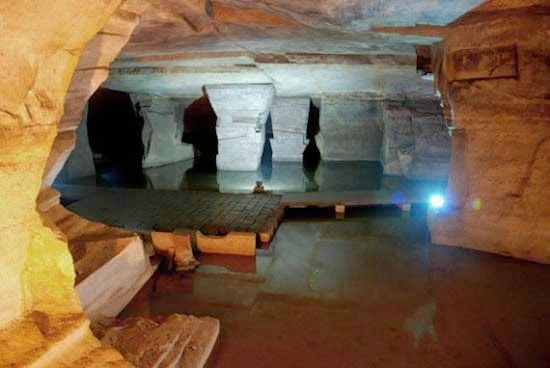 Over the centuries, the area has gone through numerous floods, calamities and wars, the mountains have changed their appearance and exposed stones have been weathered, but inside the caves, the form, patterns and markings are still clear and precise – it is as though they were built yesterday. 6. How did the builders work in the dark? Due to the great depths of the caves, some areas at the bottom, which are not exposed to the opening above, are pitch-black. Yet even those dark areas are decorated with thousands of parallel lines on the walls, columns, and ceiling. So how did the ancient people work in the dark? According to Jia Gang, a Tongji University professor specializing in civil engineering: "There should be lamps, because the cave's mouth is very small, and the sunbeam could only shine in the cave at a certain angle during a certain period of time. As one goes deeper into the cave, the light becomes dimmer. At the cave's bottom, which is usually dozen of meters from the mouth, one could hardly see anything." However, this was at least two millennia ago and nothing that could have been used for lighting has been found. 7. Were the caves meant to be connected? All of the 36 grottoes are distributed across an area of only one square kilometre. Considering such a high density, one cannot help asking whether some grottoes were meant to be connected. What would be the purpose of making so many separate caves in such a tight area without connecting them? In many areas, the walls between the caves are very thin, only 50 centimetres, but they were never linked so it appears they were intentionally kept apart. What’s more, many of the caves are almost identical to each other. Nobody has any idea who built the caves. Some scientists have claimed that it was not possible or logical for such as mammoth job to have been undertaken by regular village people. Only the emperor and the leaders could have organised such a huge project, like the construction of the Great Wall, which was built to defend against invasion from the outside. But if it was commissioned by an Emperor, why are there no historical records of its construction? 9. How did they achieve such precision? According to Yang Hongxun, an expert at the Archaeological Institute of Chinese Academy of Social Sciences, "At the bottom of each cave, the ancient [builders] wouldn't be able to see what the others were doing in the next grotto. But the inside of each cave had to be parallel with that of the other, or else the wall would be holed through. Thus the measure apparatus should have been very advanced. There must have been some layout about the sizes, locations, and the distances between the caves beforehand.
" With the help of modern equipments and methods, the investigators measured the sizes of the walls, and surprisingly found that the overall construction is extremely accurate. The walls between the caves are of the same thickness in different sections. So how did they achieve this precision? What were their methods? 10. What were they used for? Following extensive investigations and study, scientists and scholars have attempted to put forward explanations for the grottoes, but none so far provide a convincing explanation for why they were built and what they were used for. Some archaeologists have suggested that the grottoes were the tombs of old emperors, emperor halls, or places for storage. But this interpretation is far-fetched. No funeral objects or tombs have been found and no artefacts left behind. If it were used like an emperor’s palace, the grottoes would have been designed differently with separate rooms for different purposes like entertaining, meeting, and sleeping, but no evidence can be found of this and no traces of habitation have been found. Another hypothesis is that it was used for mining and extracting some type of mineral resource. However, mining operations would have required equipment and apparatus to extract the rocks and transport them. Again, no traces of this have been found, nor any evidence of where the rocks were taken. And of course, if the caves were just for mining, why create such intricate decorations on the walls, columns and ceilings? 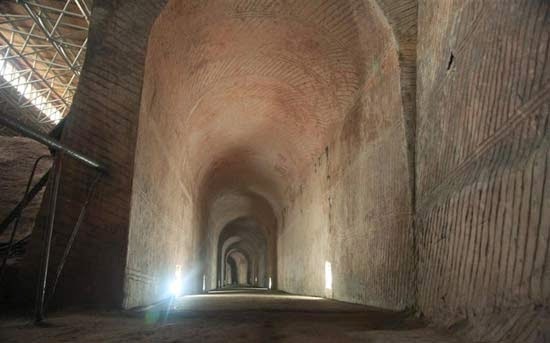 Finally, some have suggested that the grottoes were the places for troops to be stationed and that an emperor of the past wanted to keep his soldiers out of view in order to keep his war preparations secret. However, these caves could not have been built in a short period of time. They would have taken many, many years to build so it is unlikely to have been done in preparation for war, which tends to come about much more quickly. Furthermore, there are no signs of people having stayed in the caves. Despite decades of research, very few answers have emerged to explain the enigma of the Longyou caves. Our ancient ancestors have achieved many wondrous things, but this truly is an unexplained mystery.